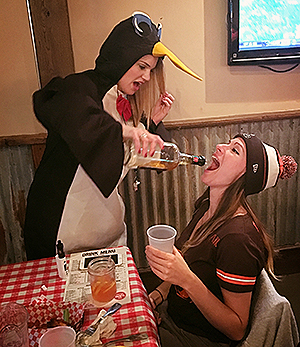 We’ll be showing every regular season game in our large private room, with over 10 TVs (only playing the Browns), a full bar and a team of dedicated bartenders and waitresses. Be sure to follow our Union Square Browns Backers Facebook page for weekly updates. And if you haven’t already, please take 5 minutes to join our chapter through the Browns Backers website. It’s free and helps us gain recognition among other chapters around the country. Full 2017 Cleveland Browns NFL Schedule below. Largest Cleveland Browns Backers bar in NYC. Located at Brother Jimmy’s Murray Hill, 181 Lexington Ave. Anyone know a shaman that can take this photo, mix with some magic and put it in liquid form so we can drink it every day until football starts? Join our @indians season opener watch party: Thursday, March 28th at 4pm. LEAVE WORK EARLY! All our usual CLE good & drink specials will be honored. THIS IS NOT A JOKE! WHAT A TIME TO BE A BROWNS FAN! How much fun is next season gonna be? Rate your excitement using only emojis. ⏰ Browns vs Ravens at 4:25pm this Sunday! Tag a friend to remind them the game got moved from 1pm! Join our last watch-party of the season. Doors open at 3pm. Merry Christmas from our Big Apple Browns Backers family to you and yours! TOUCHDOWN! @bigapplebrowns diehard and sound engineer @stan450z providing real-time footage from the game! Touchdown for the future SUPER BOWL CHAMPIONS of the world! FREE unlimited Coors Light from 7-8pm before our Saturday night game vs the Broncos! Thanks to our friends at @brotherjimmys. Kickoff at 8:20. Doors open at 6:55pm to ensure peak drinking efficiency. Full details on bigapplebrowns.com (link in bio). Sorry for partying. BROWNS WIN! Current Monday mood after a @clevelandbrowns BIG WIN yesterday.